A cheap log home kit may be your goal, but beware that in general you get what you pay for. Be absolutely certain that you know what is included in your log package and get it in writing up front from your log home manufacturer. Log shell – This is just the logs, beams and timbers necessary to construct the basic shell of your cabin -- the walls and framework. Dry-in package – This will also include cabin roofing, doors and windows to enable you to dry-in your cabin. Complete or turn-key – This package will also include trim, cabinets, vanities, etc., ready to move in. Obviously you will save on delivery and storage fees with the first option and if you already have a good contractor lined up s/he will be able to source the other components locally, often cheaper and with no delivery charges. We’ve all drooled over the enormous lodges featured on magazine covers but the expense of building (and maintaining!) one of these can be prohibitive. 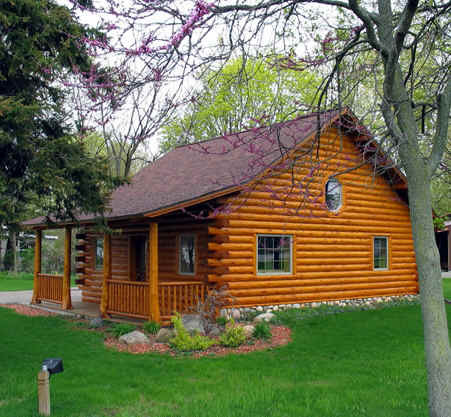 Some time spent upfront on perfecting your log cabin design will pay off during the build. Every extra corner costs more money, from the foundation, through setting logs and framing, to the roof and interior trim work. A cheap log home kit requires that you keep your plan fairly simple and straightforward. If you have a bit more money to spend add a porch or deck or an outside room to extend your outdoor enjoyment. Stay simple, save money, enjoy your cabin sooner. Another way to keep it cheap is to keep it local. Log home kit manufacturers in every part of the country use locally harvested wood. Delivery expenses will be minimized and you can be assured that the log home kit company is attuned to local building conditions and regulations. In addition you can feel good about building green by reducing the fuel burnt on a long delivery. The right log cabin home builder can save you thousands of dollars over the build process with clever ways of dealing with construction issues as they arise, with on-time work from the sub-contractors with whom they have developed working relationships, and by sourcing the right materials at the right prices. Construction of your log home is a long-term, high-dollar process and it’s vital to establish good communication and trust with your contractor. S/he will also appreciate this because it makes the entire process smoother and produces what everyone is seeking: a well-built home constructed in a timely manner at a good price. If you're considering acting as your own general contractor, you can save as much as 20% of the overall cost, but you will need to know what you're doing and have plenty of time and patience. The costs rise dramatically when you use exposed rafters and floor joists since the large beams needed to support the roof and floor loads are not only expensive, but they also require heavy equipment to set them. Using exposed rafters also means that the roof insulation will have to be dealt with by putting it on top of the roof deck in the form of rigid open- or close-celled foam. This is quite expensive and increases the labor costs as well. A cheap log home kit uses standard rafters. You can always add in some "character" beams later. Building up a solid stone fireplace is not for the fainthearted. The costs rise with the chimney height and you must support all that weight with a substantial foundation. The alternative is to frame in a fireplace insert, sheath it and face it with either thin stone or artificial (or manufactured) stone. Artificial stone weighs significantly less than real stone and in some parts of the country even costs less. The definition of a “cheap” log home kit may vary depending on your budget, but these tips can help keep your costs down. This will allow you to either afford your log home sooner or put the money you save into something on your “wish” list.